Nobu Hospitality is opening Nobu Ryokan Malibu, the first in Nobu Hospitality's Ryokan Collection on April 28, 2017. Right next door to Nobu Restaurant Malibu along Pacific Coast Highway, sits the a very modern, very exclusive new hotel retreat that is sheer seclusion and serene beauty;Nobu Ryokan Malibu is a modern luxury hideaway perched above Carbon Beach done in authentic Japanese Ryokan-inspired style. Ryokan is a traditional Japanese inn. The exclusive destination has been completely transformed from a 1950's vintage beach motel, Casa Malibu, that many locals will remember. International luxury hotel and resort designer Todd-Avery Lenahan and his design firm TAL Studio (TAL-studio.com) created 16 outstanding uniquely-designed rooms over two stories that have spectacular views, a neutral color palette and organic materials. Rich natural colors of teak, bronze and limestone fill the inside and outside of the minimalist aesthetic of traditional Japanese inns. 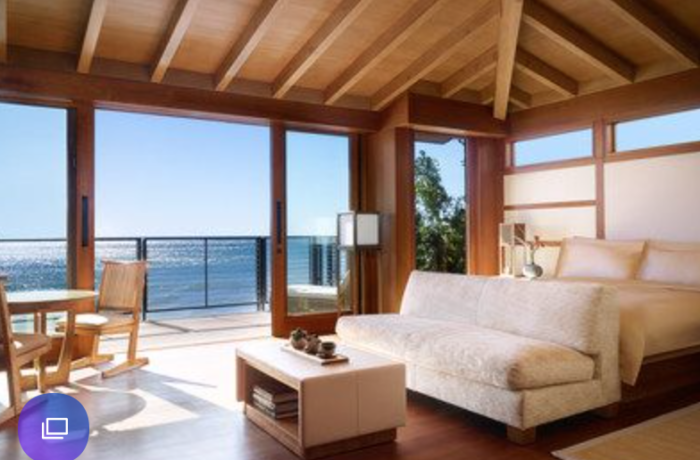 Each guest room has been individually-designed to incorporate natural California views and Japanese design elements such as tatami mats, sand-colored limestone walls and hand-crafted teak soaking tubs. Architects Studio PCH and Montalba Architects Shawmut Design and Construction, C.W. Eisner and Nikita Khan also worked on the project. The hotel includes; an outstanding dining experience, preferential reservations at Chef Nobu's celebrated Nobu Malibu, which sits alongside the property, custom crafted in-room dining menu. a 37-foot outdoor lap pool overlooking the Pacific Ocean, access to Carbon Beach, a fitness room, access to Malibu Racquet Club and a relaxation deck. The Malibu location encompasses the feeling of Omotenashi, the Japanese art of hospitality. The hotel offers a balance of luxury, seclusion, and fun. Chef Nobu Matsuhisa partnered with billionaire Larry Ellison, which the Oracle CEO who bought it in 2007 for $20 million dollars. Matsuhisa also co-owns the Nobu Hotel inside Caesar's Palace in Las Vegas. Matsuhisa's name is synonymous with upscale sushi, but he's brought his name to luxury hotels. In 2013, Matsuhisa branched out from restaurants to hotels, starting with Nobu at Caesars Palace (in a partnership with actor Robert De Niro and film producer Meir Teper.) Nobu pampers high-rolling guests with a personalized check-in, a welcome amenity in the form of green tea, and the option of having the Nobu menu—sushi rolls and signature dishes—delivered through room service for those in Vegas. The Nobu Ryokan Collection overall is a group of exclusive retreats located in exotic destinations and gateway cities where guests seek luxurious sanctuaries in discerning environments. The hideaway retreats offer distinctive service and luxury products each set with an authentic Ryokan-inspired style. "It’s a new concept for us, a luxurious boutique hotel wrapped around food and beverage," Trevor Horwell, CEO of Nobu Hospitality Group told Condé Nast Traveler. "And it's very much a retreat for people who don’t want to be seen." One would think Nobu Ryokan Malibu will be full as Malibu is so sort on hotel rooms. Nobu's only real competition is the Malibu Beach Inn, a 47-room boutique hotel just down PCH.Going to Nobu in Malibu for dinner? Now guests can stay the night. Reservations for Nobu Ryokan Malibu can be made by visiting www.noburyokanmalibu.com. Named one of luxury's 25 Most Innovative Brands by Robb Report, Nobu Hospitality is ranked among an elite selection of global luxury brands. The natural growth of Nobu hospitality built on service, image, and reputation, offers the complete spectrum of hotel and restaurant management for unique projects around the world. Owned by Nobu Matsuhisa, Robert De Niro, Meir Teper and James Packer, with operations spanning five continents, the Nobu brand thrives in the world's capitals as the ultimate destination lifestyle experience. The first Nobu Hotel opened in 2013 as a boutique hotel within Caesars Palace Las Vegas and was subsequently named one of the Hottest New Hotels by CNN Travel, Top North America Hotel Opening by Luxury Travel Advisor and subsequently Luxury Travel Advisor's Award of Excellence. The Nobu Hotel City of Dreams Manila opened in 2014 and Nobu Hotel Miami Beach in 2016, followed by Nobu Hotels in London, Malibu, Ibiza, Marbella, Riyadh, Los Cabos, Chicago, Toronto, and Bahrain. Nobu is strategically focused on further expanding its global portfolio of hotels through a solid development pipeline. Horwell hinted at more Nobu hotel announcements to come, citing a city "in the Northeast of the U.S." along with Brazil and Toronto. That’s in addition to the existing Nobu pipeline which currently includes Chicago, Bahrain, and Los Cabos. Not to mention the 33 Nobu restaurants that are still serving up sushi and sake across five continents, the largest of which recently opened in the Four Seasons Hotel in Doha.